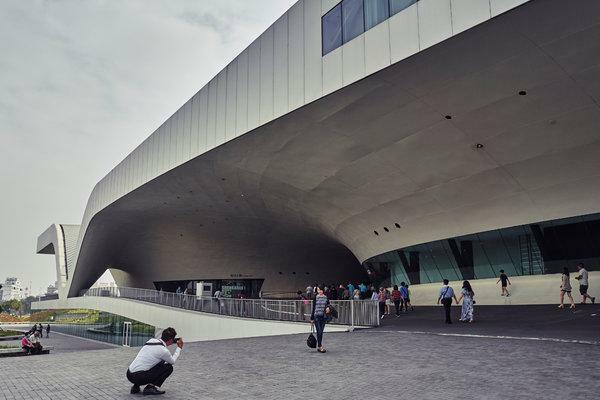 KAOHSIUNG, Taiwan — The National Kaohsiung Center for the Arts in Taiwan stands out for its colossal presence and undulating design. Some people here say it looks like a spaceship. Others think it resembles a giant sting ray. One point is not contested, however. With a look inspired by banyan trees and the local shipping industry, the arts center has raised the cultural prestige of this southern Taiwanese city while providing residents with a popular public space. The opening capped a transition for the site, a former military base established by imperial Japan during its colonial rule of Taiwan. After World War II, it was occupied by Chiang Kai-shek’s Kuomintang. Today, the 1.5-million-square-foot arts center sits at the north end of Weiwuying Municipal Park, which opened in 2010 and is roughly one-seventh the size of Central Park. Visitors to Kaohsiung might mistakenly think the arts center has long been a part of life here because of the way residents have so openly embraced it. In the morning, people practice yoga on mats while others jog through Banyan Plaza, the building’s covered square, which connects the four halls: a 2,236-seat opera house, a 1,981-seat concert hall, a 1,210-seat playhouse and a 434-seat recital hall. Films are shown in the plaza, and free public activities such as dance classes and martial arts lessons for children are held there. Inside the building, residents have access to free exhibitions; the current one highlights the evolution of Taiwanese opera. With an Instagram-friendly exterior and interior, selfie-takers are ubiquitous. Attendance has averaged above 80 percent for the first season of performances at the art center. Many performances, including the December opening of the opera house featuring Taiwan’s world-renowned dance troupe Cloud Gate, have sold out quickly. For the arts center’s grand opening in October, several thousand people attended a special performance at a terrace where the canopy-like roof slopes to the ground, creating an amphitheater. It has become a popular place for residents to sit and watch the sunset. On the day of the grand opening, Taiwan’s president, Tsai Ing-wen, spoke at the building’s dedication, lauding it as an example of “spatial democratization” in Taiwan, which liberalized its political system in the 1990s after four decades of martial law. “The establishment of an arts center at this venue symbolizes the removal of martial law and our efforts to promote greater cultural accessibility,” Ms. Tsai told a packed concert hall. Unsurprisingly, the area around the Weiwuying arts center has become a rising star of the city’s property market. Property prices around the park and arts center have risen by 15 to 20 percent in the past two years, said Alex Kuo, director of a nearby office of Yung-Ching Realty. The new luxury apartment buildings beginning to pop up nearby contrast with the Weiwuying arts center’s working-class aesthetic. Ms. Houben and her team at Mecanoo initially struggled to find the right exterior for the massive arts facility, but eventually found inspiration in the city’s maritime identity — two decades ago it was the world’s third-busiest port. Selling the idea of making a modern, multimillion-dollar cultural center that had an exterior similar to a container ship rather than something sleek like glass and steel took some work. Its modern design reflects Taiwan’s steady move away from Chinese-style design after democratization, a sign of the shift of identity here from Chinese to Taiwanese. Mecanoo brought a theater consultant on board to make sure sufficient thought was given to both form and function. The acoustics of the concert hall, Taiwan’s first with 360-degree seating, make performances in the large space feel deceptively intimate. For instance, the recital hall’s asymmetric design facilitates viewing of the pianist’s hands. “The design principle that Francine brought to Weiwuying was to get people close to the arts, and close to each other,” said Chien Wen-pin, the arts center’s executive and artistic director, a position he took after serving as director of Deutsche Oper am Rhein in Düsseldorf for 22 years. A native of Taipei, Taiwan’s capital in the north, he was persuaded to return to Taiwan in 2013 by the island’s culture minister, Lung Ying-tai. Mr. Chien praised the versatility of the stages and performance spaces in the arts center’s four halls, which he said he hoped would enable performers to re-envision their art. The arts center at Weiwuying appears to be off to a strong start: It had 800,000 visitors in its first nine weeks after opening, and larger performances have drawn audience members from Taiwan’s northern cities as well as farther afield, including Japan, Hong Kong and Singapore. It also seems to be well received by those who do not take particular interest in the arts. Chen Hsiao-li, a Kaohsiung resident who runs a small shop selling betel nuts and cold drinks near Weiwuying, said she thought the arts center would help revitalize the neighborhood.